Escape From Berkeley, By Any Non-Petroleum Means Necessary! This morning, I headed over to Shipyard Labs in the Berkeley flatlands (not very coincidentally, located just a few blocks from the 24 Hours Of LeMons HQ in Emeryville) to witness preparations for the start of the Escape From Berkeley race to Las Vegas. The rules are pretty simple: vehicles can't run on any form of petroleum fuel, they can only bring 10KWH equivalent of fuel to start with, and the teams must obtain all further fuel for free along the race route. Otherwise, anything goes- and they've managed to get permits to stage this madness on public roads! Make the jump to see some of the machines that will be competing for the $5,000 first prize. First, we've got a whole bunch of bio- and veggie-diesel-powered Mercedes-Benzes and Volvos; no need to go into great detail here. The teams will be begging used fry grease from restaurants, or maybe doing hit-and-run shoplifting raids on grocery stores for fresh jugs of cooking oil. Might be some interesting social engineering involved, but the technology is proven and therefore not all that exciting for us. Then we've got a variation on that theme, with the MAX, a Kinetic Vehicles Locost equipped with a 30-horsepower Kubota 3-cylinder diesel running canola oil. These guys feel that the future does not belong to waste oil (not enough of it to run all our vehicles), so they're going to stand on principle and shoot for donations of fresh canola oil from potential spur-of-moment sponsors (Costco was mentioned) along the way. The car looks well-made and the team has its act together, so the only drama will likely involve fuel scavenging hijinks. 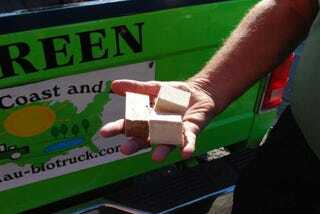 Here's my pick to take the win: the Green Team, which runs on gasified wood chunks. This setup was created by a bunch of engineering brainiacs at Auburn and they've already driven their Dodge pickup to Berkeley from South Carolina without mishap. They've got a great setup: wood (or any carbon-containing material) is heated in the reactor and turned into hydrogen and carbon monoxide, which is then piped to the engine and burned like any other fuel. The Green Team has a table saw powered by a generator, which is fueled by the same stuff that runs the truck's engine; this makes it a snap for them to take any ol' scrap wood and cut it into the 2" cubes that the reactor likes best. Downed tree branches, heaps of wood chips, busted-up-pallets- if they can get it in the reactor, they can drive the truck at highway speeds. The gasification idea sounds great to All Power Labs, so they put together this '86 Accord with hacked ECM that allows switching between gasoline and "any solid carbonaceous material." Unfortunately, even after an all-out 24-hour thrash before the race, the bugs hadn't all been worked out and the Accord wouldn't be making the race… this time. Check out the power-window motor that runs the fuel-feeding auger. Then you got your bike riders. Tried and true technology, not much to go wrong, slow and steady wins the race and so on… but shouldn't these guys have to scrounge their own "fuel" (i.e., food) on the route? Apparently they're allowed to buy food at will, which was the cause of some grumbling among the other teams. Wild blackberries, possum innards, and hobo-style handouts, we say! This tandem bike has a small internal-combustion engine on the back to help the pedalers; the team members were too busy to explain the fuel type, but the non-diesel appearance of the engine leads me to believe it's alcohol. Then we've got the machine that, were there any justice in the world, would chug its way to checkered-flag glory on the Vegas strip: the steam-powered Kristie's Flyer. Built by the Neverwas crew out of an old carriage and the contents of many junkyards, this fine machine burns vegetable oil and can attain a top speed of a blistering 15 MPH. Sure, that's pretty pokey, but look at all the shiny brass and hissing valves, and it's got an insanely loud steam whistle right out of the Industrial Revolution! The "suspension" looks pretty harsh, and the steering gear seems to have been something of an afterthought, but we're rooting for the Kristie's Flyer to make a good run. With "Eastbound And Down" cranking on the PA, the race officials got the crowd all fired up for some racing action. I couldn't be there to watch the havoc these vehicles will play on local streets, however, because I had to get back to Alameda to shoot more emblem and hood ornament pr0n at the annual Park Street Classic Car Show. Come back later to check it out!